To be an effective focal point and accent in the landscape, design characteristics and how a homeowner interacts with a water feature are key. For instance, this project was the result of a homeowner looking to create a simple, low maintenance waterfall in a small, but reasonable space- 6ft by 6ft area. Proper waterfall design is essential to avoid having the waterfall look unnatural, or what is commonly referred to as the "volcano effect." Despite the confined space, the grade change is masked by a combination of stone placement, terrestrial (land plants) plantings along with their counter-parts, aquatic plants. No water feature is complete without landscaping; making water features not only an effective accent to the landscape, but the perfect starting point for any landscape renovation. 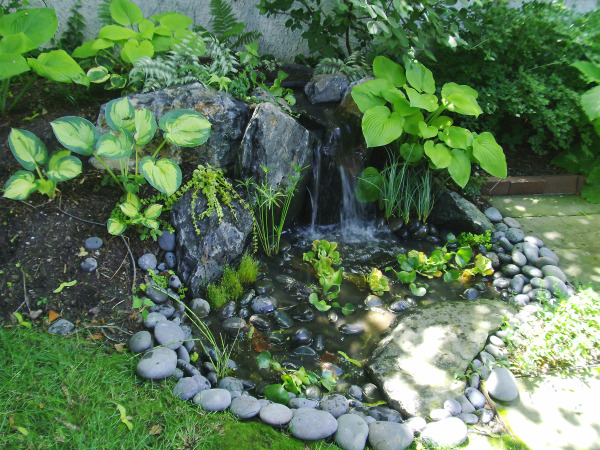 Aquatic plantings soften gravel and stone which are the back bone to any waterfall project. Consider plantings, aquatic and landscape perennials, trees and shrubs as "putting the clothes" on a water feature. Plants are essential to completing the look, helping blend a cascading waterfalls into its natural surroundings in the yard. PondBuilder equipment such as the Elite Cascading Falls, Pump Canyon and Water Basin Matrix being used in this simple Pondless waterfall, will make installation easier on any DIY families and professional Contractors. PondBuilder has Cascade Falls equipment for all sizes and design types. Lower your maintenance by selecting the correct waterfall equipment from the get go! Overall, this modest waterfall creates a significant impact for the space, it allows the homeowner the quaint sounds of water at home, and was well worth the minimal expense for the stone, pond supplies and plantings. Let PondBuilder help you plan your next water feature using our water feature resources or consult your local expert, in this case Kane Brothers (Authorized PondBuilder Contractor) in Illinois.